There is sad news to report … Geraldine Ferraro, the first woman Vice Presidental candidate to run on a major party ticket has died at the age of 75. According to reports, Ferraro passed away from complications from multiple myeloma that she has fought for many years. She passed away at Massachusetts General Hospital surrounded by her family. Our prayers go out to her family, may she rest in peace. Ferraro, who was born in Newburgh, New York, passed away today at Massachusetts General Hospital while surrounded by her loved ones, a statement from her family read. 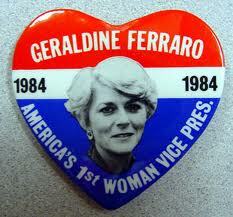 Geraldine Ferraro is most famously known for being the first female to be a VP candidate on a major party ticket. Before there was Sarah Palin, there was Geraldine Ferraro who was Walter Mondale’s VP candidate who faced Ronald Reagan and George H.W. Bush in the 1984 election. She broke the glass ceiling of the old boys network of having a man on both the top and bottom of the ticket. However, it would not be until 2008, some 24 years later before another woman would be named as a VP choice. Sarah Palin wrote on her Facebook page regarding the passing of Geraldine Ferraro. My family and I would like to express our sincere condolences to the family of Geraldine Ferraro. When I had the honor of working alongside Geraldine on election night last year, we both discussed the role of women in politics and our excited expectation that someday that final glass ceiling would be shattered by the election of a woman president. More from CNN, “Geraldine Anne Ferraro Zaccaro was widely known as a leader, a fighter for justice, and a tireless advocate for those without a voice. Ms. Ferraro was one of the first Pioneers on the level she was for women in Politics at the level she achieved. Just realized how repetitive and redundant by post sounds when I re-read it back. Geez, Sorry about that…major brain clouds in Boston today. *my. Wow, think I’ll hang up the blogging for now. Among many of her views and opinions it was Ferraro’s attitude toward abortions that stirred quite a lot of controversy since she expressed her opinion that women should be given the right to make their own free choices. But on the other hand, being a Roman Catholic she said she would never do it herself.